203 years ago today, German printer and publisher Ernst Litfass was born. Litfass is best known for his invention of the free-standing cylindrical advertising column – the Litfasssäule (Litfass Column) – that premiered in Berlin in 1855. During the first half of the 19th century, posters had seen a huge increase as a means of advertising. The uncoordinated posting of announcements and ads on homes, trees, walls and any open street corner became a nuisance which resulted in a decree in 1849 that prohibited any placarding of posters with the exception of government notices. 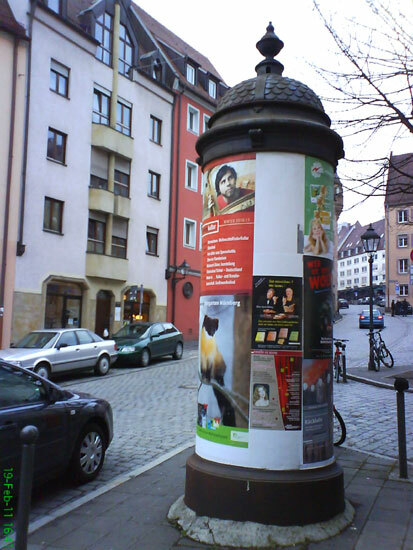 Litfass responded to the demand for a regulated system and signed a contract to erect special advertising columns throughout Berlin to address the problem. In return, he was granted exclusive rights for the display of the posters.